Multiplexing single-thread, fully asynchronous network I/O and data processing model that eliminates memory management, scheduling, and IPC inefficiencies present in some multi-threaded clients. Advanced HTTP/1.1 features such as range requests, content compression, and keep-alive connections, as well as forced response size limiting, to keep network-level overhead in check. Smart response caching and advanced server behavior heuristics are used to minimize unnecessary traffic. Performance-oriented, pure C implementation, including a custom HTTP stack. Graceful handling of multi-framework sites where certain paths obey a completely different semantics, or are subject to different filtering rules. Automatic wordlist construction based on site content analysis. Probabilistic scanning features to allow periodic, time-bound assessments of arbitrarily complex sites. Three-step differential probes are preferred to signature checks for detecting vulnerabilities. Ratproxy-style logic is used to spot subtle security problems: cross-site request forgery, cross-site script inclusion, mixed content, issues MIME- and charset mismatches, incorrect caching directive, etc. The issues with MacOS X & FreeBSD are fixed. 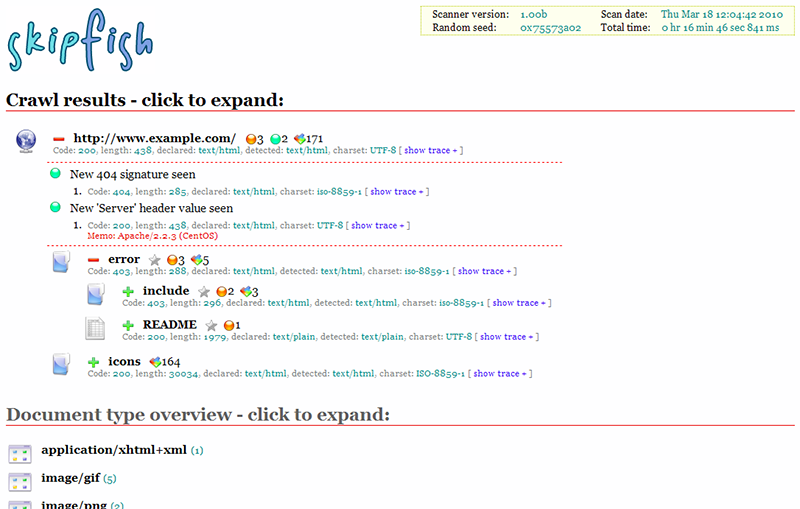 A minor improvement to XHTML / XML detection. Several build fixes for FreeBSD, MacOS X. Final workaround for FORTIFY_SOURCE on MacOS X. A minor tweak to reject certain not-quite-URLs extracted from JS. Workaround for a glitch in glibc "fortify".